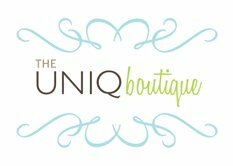 TheUNIQboutique is a creative design online store that offers a selection of professionally designed paper products, designed and produced by Amy Mills, the owner of UNIQLOVE custom invitations. Unlike some larger online design sites that mass produce paper goods, theUNIQboutique offers professional designs what are hand created. This means that you can pick from a selection of pre-designed products, and Amy herself hand-makes your order upon your purchase. You get the feel of custom work, without having to do the extra work.